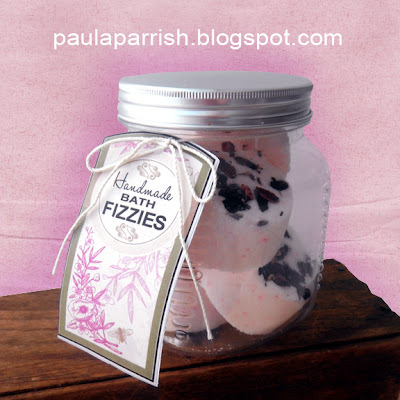 I love homemade bath fizzies. There is something magical and captivating about watching it fizz and bubble away down into the bath water. They seem to take on a new life once it hits the water. They fizz, hiss, and melt, leaving the fantastic smell of essential oils, and at the same time the natural oil leaves your skin smooth, soft and super moisturized. It was a beautiful thing, plus super fun at the same time. In a bowl, place citric acid, baking soda, cornstarch and mix, then add the oil. Add your choice of essential oil. Mix well with a fork, then with your hands until a soft dough is formed. If you find that the mixture is too crumbly, spray with tiny bit of water to moisten. Knead into a ball, the consistency should be like soft biscuit dough. Press the soft dough into any molds of your choice. You can add colored epson salt, oatmeal, dried herbs or flowers into the bottom of the molds for an extra special touch. Sprinkle in just before pressing the dough into the mold. Silicone baking molds work the best. Customize your scent to take full advantage of aromatherapy benefits. Lavender essential oil will bring calm and comfort. Peppermint essential oil increases energy and clears your mind. 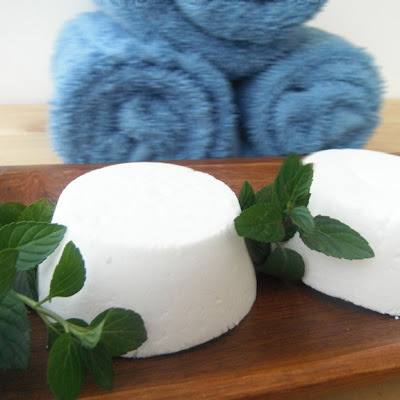 I made one batch of eucalyptus fizzies to keep on hand, which is a great choice during allergy season and if anyone is feeling a bit of congestion. 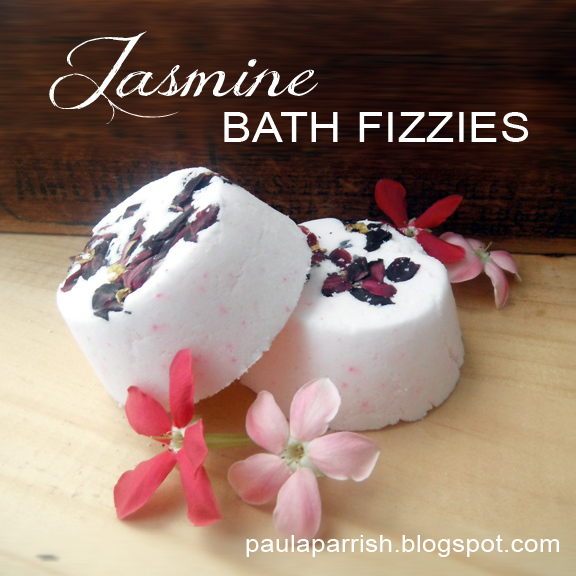 I also created a batch of jasmine fizzies with jasmine petals from our yard. Jasmine essential oil is known to have a uplifting effect on the mind and fights depression anxiety and stress. 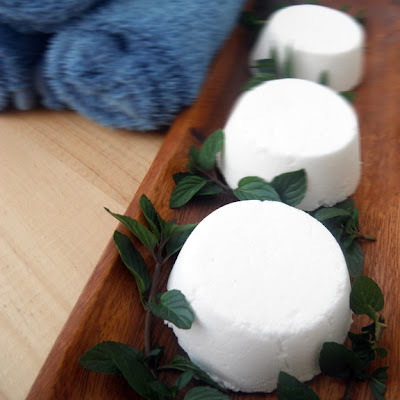 If you simply don’t have the time, or don’t wish to make this bath bombs at home. I have handmade bath bombs available for purchase on my website. Thanks for taking the time to stop by and visiting my blog. So great! Can't wait to give them a try! Thanks!!! Wow. What a great idea and thanks for the recipe. Seems easy. Thanks for sharing this with us. 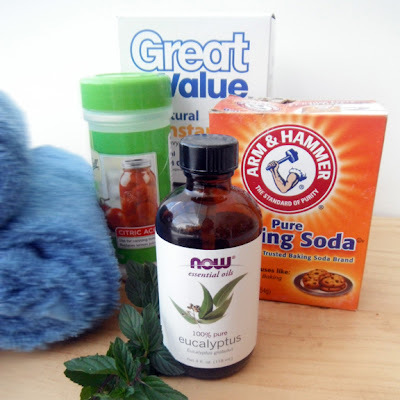 I have a lot of allergies and trouble with scents, so I can customize this to my own needs. It also would make a lovely gift for others. I appreciate you giving us such great info and I look forward to trying this out. Nice! I love this as a gift idea. These are beautiful. I really must try these. looks like a fun thing to try. Thanks for stopping by and sharing this at the Sunday Round up. I can't wait to see what you bring to share next week. Hi Paula! Thanks so much for stopping by today! :) Those Jasmine fizzies are super neat! Look forward to checking out your blog now! I agree I love bath bombs as well! Where do you get the essential oils? FABULOUS tutorial. These are beautiful and would be fun to give as gifts, too. That is so creative! I never thought of making those yourself. That is awesome and creative! Also looks so pretty in the jars. Thanks for the recipe! These will be perfect for summer. Thanks for linking up at Grits & Giggles! This is so cool and pretty, too! Thanks for the recipe! I have a Sunday Blog Hop going on right now and I would love for you to link up your cute blog. Stop by and join the fun! I tried making theses yesterday and mine were nothing like yours. I followed the recipe but mine were wet and oily.......any tips or suggestions? Looks fun to make and use--unfortunately I only take showers! I am going to try these today along with your chocolate chip lip balm! I have peppermint e.o. on hand, so will scent them with that! thanks. How long do you wait to remove these from the molds? Paula, just wanted to let you know I made your bath bomb fizzys for my girls and some friends for Christmas, and they were a big hit. They came out so nice. I scented them with Almond Biscotti and ground up dried rose petals for accent. Absolutely beautiful, thanks, I love this recipe! Hi! Can you please tell me how many bath bombs you made with this recipe? Thank you! do you just let them dry (a little) and pop them out of the molds? Once the mixture is in the molds how long should it remain until removed? I let my bath bombs dry over night in the molds then remove them in the morning. can you use fragrance oil instead of eo?